There's only 40 Winks left in the world of dreams. And if you don't rescue them from the evil NiteKap, NO ONE will EVER have good dreams again! So get ready for action - because you're going on the adventure of a nighttime! 05-17-2018 rx79 Box Text Conquer Your Nightmares and Rescue Your Dreams... There's only 40 Winks left in the world of dreams. And if you don't rescue them from the evil NiteKap, NO ONE will EVER have good dreams again! So get ready for action - because you're going on the adventure of a nighttime! 05-11-2013 empovyle Box Text Conquer Your Nightmares and Rescue Your Dreams... 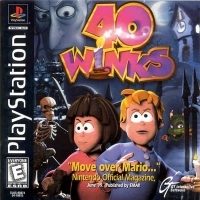 There's only 40 Winks left in the world of dreams. And if you don't rescue them from the evil NiteKap, NO ONE will EVER have good dreams again! So get ready for action - because you're going on the adventure of a nighttime! 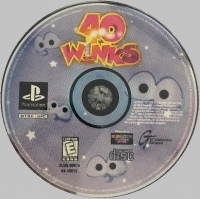 This is a list of VGCollect users who have 40 Winks in their Collection. This is a list of VGCollect users who have 40 Winks in their Sell List. This is a list of VGCollect users who have 40 Winks in their Wish List.